Recently a new book was released titled, Publishers on Publishing: Inside India’s Book Business. and I had the honor and privilege of being interviewed for a chapter in the book. What follows is an excerpt where I answered specific questions posed by the editor. One of the main things I realized as I went through this process is the world has shrunk for authors. The challenges and opportunities that used to be country specific are now true for almost every author no matter where they are located. That is why it is more critical than ever that authors stay informed through resources like the Author Learning Center. See if you agree with my answers. What is the role of self-publishing in publishing world today? Has it changed over the last decade or so? Self-publishing has created a dramatic shift in power and control of the market. Prior to self-publishing becoming a viable alternative, the power to decide what readers could purchase rested in the hands of agents and publishers. But now, authors who self-publish have a say as to what is available to readers. So the market has more choice than ever before. In addition, authors who believe in their books, can still make them available to readers even though agents and publishers may reject them. Publishing is now democratic. This revolution started about 15 years ago, but what has changed in the last decade is self-published books are better. More authors are taking more time to write a better book and investing in editing so their book is as good as it can be. A second trend is Hollywood is now looking at self-published books for ideas. That would not have happened 10 years ago. The need and the reasons your company has introduced this within Author Services and done so recently? What has been the experience and trends in India? If you are looking to self-publish, you have three options. The first is Do-it-Yourself (DIY), where you do everything yourself using a platform like Lulu. The second option is what I call General Contractor, where you hire the people to do the work, but you coordinate the activities. The third option is supported self-publishing, which is one company who offers every service you need to get your book done. Simply put, there are authors who want the convenience of having a one stop shop of professional services available to them. That way they don’t have to depend on their own talents or take the time to search for what they need. They have one phone number to call to get everything they need to get their book complete. Here is a link to a white paper called The Four Paths to Publishing which gives you even more detail. As for India, our experience has been similar to other countries around the world. There are a certain set of authors who prefer to work with one company rather than do the work themselves or try to find the resources they need. How does the economics of self-publishing work, for publishers? How does it compare to traditional publishing? The main differences between self-publishing and traditional publishing is who makes the investment of money, who controls the content and speed to market. In both cases, authors earn royalties, but traditional publishers have the ultimate say what the final content is and how soon it is made available for readers. Self-publishing requires the author to make the financial investment, but the author is in control of the content and speed to market decisions. Also, in most cases, the author can earn a higher royalty percentage when they self-publish. What are the services most used? Is it more publishing services or for dissemination? The services most authors use are book and cover design for both print and e-book. And we make sure those books are available in distribution. Books used to be a planned purchase, but with online purchasing and digital books, books are now a spontaneous purchase. So authors don’t have to make a decision about what distribution or formats they want. We make sure their books are available for readers anywhere and in any format they want to read. Beyond those services, a number of authors also purchase editing services to make sure their book is as good as it can be. Marketing services are not as significant for Indian authors because it is a bit more difficult to cover the market with one service. I think design and distribution are the hardest things for authors to do well so we make them available in a very easy way. And if your book is not designed well or available in all formats, you have very little opportunity readers will find it. You mentioned about how self published books get picked up by publishers for traditional publishing. Could you tell us a bit more about how this happens and why? Please share a specific case study. There are two primary ways books get found by traditional publishers. First, many traditional publishers operate self-publishing platform. That gives them early visibility into books that are getting early sales momentum. A second way self-published books get discovered is by agents or editors watching lists on Amazon. If they see a book climbing, they will reach out through social media to contact the author. A great example is the book, The Top 5 Regrets of the Dying, written by Bronnie Ware. Bronnie was a palliative care nurse and began to see themes among the people she was working with near the end of their lives. From that experience she wrote a book. However, she lived outside of any major city in Australia and had no hope of finding an agent or publisher so she self-published with Balboa Press, which is a division of Hay House, a traditional publisher. Her local paper wrote a story. Then The Guardian in the UK picked it up and then it spread like wild on Facebook. Within a month Hay House picked up her book and now it has been translated in 27 languages. Had it not been for self-publishing, Bronnie would have never been published and Hay House would have never seen the book and the world would not have been enriched by her writing. With the role of publishers changing to become more for dissemination and visibility rather than for editorial and production, what impact would this have on the self-publishing landscape? Self-publishing will continue to evolve and create more services that enable authors to make more readers aware of their books. How do publishers remain relevant in an arena where self publishing and purchase of bespoke services becomes easier? Future of traditional publishing v/s self publishing? Publishers are like movie studios. There are some books that would benefit from the expertise and experience of a traditional publisher, just like some movies need the resources of a big studio to make the project come to life. So as long as there are books like that, traditional publishers will always have a role. As for the future, I think traditional publishers will publish fewer books, but they will be bigger books. Just like we see with movie studios. Self-publishing will continue to grow as more titles are made available in the market so readers will have more choice than ever before. That will be a good thing because more authors who can impact people with their writing will have that opportunity. 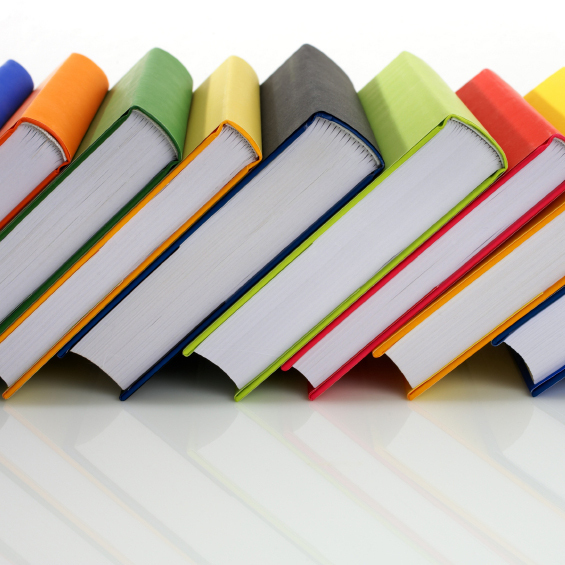 Also, self-publishers will offer more resources to authors such as The Author Learning Center (www.authorlearningcenter.com) to help authors produce better books and get to their goal. In my most recent post, I published the text of the closing address I gave at the Blue Ridge Christian Writers Conference titled, The 2nd Gutenberg Effect: How self-publishing is creating exciting new opportunities for Christian authors. The main point I tried to make was that self-publishing is providing Christian authors the opportunity to spread their message in a way that hasn’t presented itself in such a significant manner since Mr Gutenberg invented his press. Take Annie Downs for example. I do not know how many people you will impact with your writing if you publish, but do I know how many you will if you don’t. 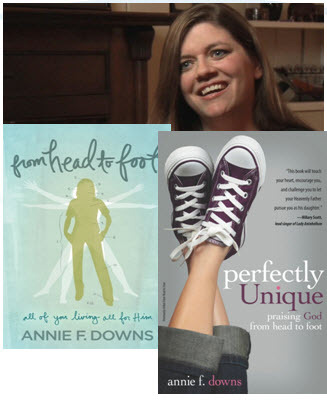 Annie Downs has used self publishing to impact young people with her self published book and obtain a contract with Zondervan. She is a blogger and speaker who focused on young women and their need to really understand their identity and significance. After many of her talks, she realized she had nothing to leave to with people. So she pursued self-publishing and published her book with the title, From Head to Foot. As she continued to blog and speak, her platform grew, sales increased and an agent took notice. He shopped the book and Zondervan offered a contract and republished the book with the new title, Perfectly Unique, praising God from head to foot. I featured Annie in a blog post I almost a year ago. If you want to know more about her story, you can read the post and see a video interview by clicking here. The second example comes from my own experience. I never set out to be an author, but years ago, I was working on a curriculum and writing some material to support lessons in that curriculum. As people started to use the material, they started asking for copies of the readings I had written for the lessons. So I would run to Kinkos and make copies. Frankly, it got to be expensive and tiring so I explored how to get published. It was really a niche book because it addresses the issue of how a person’s worldview is formed. I did not think it had wide commercial appeal so I decided to self-publish. And this was all before I worked for Author Solutions. The book has been available for a few years, but about three years ago, I got an email from a gentlemen in Italy. He explained he had been using the book at the Institute where he teaches. When I asked him how he got the book, he told me an associate of his was given the book at a conference he had attended the year before. He went on to explain they now had interest from an Italian publisher and wanted to get it translated and publish it in Italy. He was writing for permission, which I gladly gave. 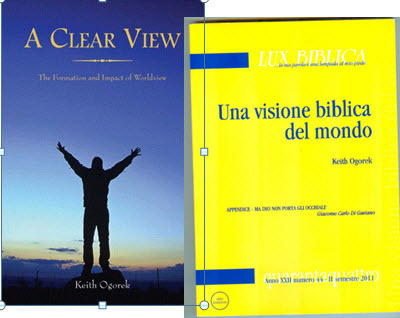 Then some months later a box arrived at my house with multiple copies of the Italian version of my book, A Clear View. Now the royalties from this book will never be life changing, but the thought that someone in another country was willing to invest the time and money to translate and publish it, is very satisfying. I suspect if you are reading this, you have a manuscript in the works or ready to go and you may be pondering your options. You may also be overwhelmed by the options you have today as an author. But you should investigate self publishing as an option. Because while I do not know how many books you will sell if you publish, I do know how many you will if you don’t. Even more importantly, I do not know how many people you will impact with your writing if you publish, but do I know how many you will if you don’t. Writing is a talent you have been given, but publishing is part of your stewardship. So I hope you will seize the opportunity that is before you to get your work into the hands of readers and spread the story and message God has given you. Four Paths to Publishing featured in Beyond the Book podcast interview. If publishing is on your list for 2013 goals and you are confused or wondering about the options you have available, this will help. Recently, I did an interview with Chris Kenneally, host of the Beyond the Book podcast. The focus of our discussion was the new whitepaper, The Four Paths to Publishing which I have mentioned numerous times in this blog and is available to download here. Chris introduces the segment with the following write-up on the BYB site. Across publishing – once an industry virtually unchanged for centuries – revolutionary transformation is under way. Instead of an industry reliant upon middlemen and suppliers, publishing is becoming a service consumers can purchase.In a newly-published white paper from Bloomington-based Author Solutions, a world leader in indie book publishing, Keith Ogorek enumerates four clear paths that authors may follow to achieve their publishing goals. The interview is available to listen to on the Beyond the Book website or on iTunes. I think you will find it helpful as you consider the best publishing path for you to pursue. The 3 most common questions authors asked me at the GLAWS event. Earlier this month, I had the opportunity to speak at an event sponsored by GLAWS (Greater Los Angeles Writers Society). It was held on the campus of Los Angeles Valley College and we had a packed house. It was a great day despite the 100+ degree weather in Southern California. My presentation was titled, The Four Paths to Publishing and with it, I outlined the four different opportunities authors have today to get their books into the hands of readers. In just a few weeks, I am going to publish a white paper with the same title, but essentially what I said was an author can choose from one of four options to get published today. DIY–This involves using an upload or online formating tool to get the book in distribution. General Contractor– Here the author hires a number of independent contractors to complete the book and market it. Publishing Package— With this option, an author chooses an assisted self-publishing company who packages all the services into a convenient one-stop shopping opportunity. Traditional Publishing–This is as it has always been. The white paper will provide much more detail about each of these paths and discuss the advantages and drawbacks to each option, but the feedback from the seminar was this framework was very helpful to people as they try to navigate the new landscape of publishing. After the presentation, we opened up the floor for questions, which I always enjoy. There were more than an hours worth, but as I reflected on them later, I realized there were some common themes. Here are the three most common questions I was asked and a brief sentence or two on how I answered them. Which path is the best one for me? By far, this what most people were trying to figure out. Unfortunately, there is not one right answer, but there is a way to determine which path is best. Make sure you clearly articulate your goal for the book, the skills and experience you have, what time commitment you can make, and how much of a budget you have. 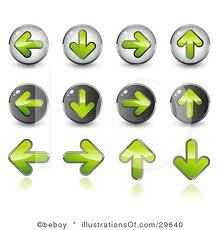 With those items clearly identified, you will be able to choose the best path. I have a children’s book. How do I find an illustrator. Just like with the first question, there is not one answer that applies to every author. Depending on your goals and budget, there are a number of ways you can find an illustrator. First, if you pursue the publishing path option, most companies offer illustrations as part of their services. If you don’t want to utilize that option, you can find freelancers on sites like www.elance.com or www.odesk.com. Finally, if you live near a college or university, you might find some talent on those campuses looking for projects. However, you always want to be careful about setting expectations, deadlines, deliverables and payment terms. I have published three books with traditional publishers in the past, but all the editors I worked with are retired or dead. What do I do now? Ok, that was not a common question, but I thought it captured the anxiety and confusion many previsouly published authors are feeling right now. The publishing world has changed and while that can be frustrating, it also means there is more opportunity than ever before. So I told the gentlemen who asked the question that he should pursue self-publishing and agents and publishers would discover him anew. For the first time ever, Writer’s Digest Conference brings its real-world publishing knowledge, writing inspiration and networking opportunities to a West Coast audience in 2012. Join us in Hollywood to find out how publishing and tech developments affect writers, how you can make your work and your pitch irresistible, and what you can do to get going, get discovered, and get published. I will be speaking about the secrets I share in this e-book. You can download it for 99 cents at http://www.booktango.com if you don’t want to wait for the seminar. Dana Newman, Attorney and Literary Agent, Dana Newman Literary, LLC, Eric DelaBarre, Writer/Director, Seven Publishing, Brian Felsen, President, BookBaby, Stephen Blake Mettee, CEO/Publisher, The Write Thought Inc. and K.C. Sherwood, Abbott Press Author and winner of the Mark of Quality. There are a number of other seminars or panels that address the topic of self publishing because clearly it is the topic that is on everyone’s mind. I am really looking forward to my time there and hope to see you in Hollywood as well. Registration information is available on the web site. Just click here for more info. The world has changed for authors which means they have new opportunities and consequently responsibilities. As you can imagine, with the announcement a few weeks ago about Author Solutions being acquired by the world’s largest publisher, there has been an enormous amount of media interest. This is both a thrilling and confusing time for authors, so I think it is more important than ever for authors to be informed and choose the best option for getting published based on their goals, skills, patience, and budget. My last post suggested there were four paths authors could pursue today, and I laid out the differences among them. But recently, at the end of a very thoughtful and comprehensive interview, I was asked the question, “Is there anything else you would like to say to authors today?” What follows is my response to that question. That means authors have more opportunity than ever before, but they also have more responsibility. And that is not something anyone seems to be talking much about. Whereas before it was the publisher, now it is the author who has the responsibility to set clear goals and a budget. Having clarity about these two areas will help authors make the best decision about which publishing path is best for them. In addition, they also need to have a realistic assessment of the skill and time they have to put to the project. You can absolutely change your brakes and wash your car for less money if you do it yourself, rather than paying someone to do it for you. But if you don’t know how to change brakes or you don’t have time to wash your car, you should pay someone to do it for you. I think the same type of decision-making should be applied to making a publishing decision. Make sure you have a clear picture of who the audience is for your book. Saying your goal is to sell to every man, woman, and child on the planet (I had an author tell me that) is not realistic. Understand your options. DIY, assisted, and traditional publishing all have advantages and drawbacks. Inform yourself. There is plenty of information out there. In fact, that is why we created the Author Learning Center (www.authorlearningcenter.com) and why I published 7 Secrets of Successful Self Published Authors. It’s an ebook on booktango.com for 99 cents. We have been told by many authors that both the ALC and the 7 Secrets are very helpful. Think about your marketing while you are writing your manuscript, and know there are no guarantees with marketing. Just ask any marketing director at any company in the world. You do some things that you think will work and they don’t, but you also do some things that far exceed your expectations. The key is to be consistent and experiment. Not everything is going to work, but if you do nothing, you don’t stand a chance. This industry-changing shift in publishing does not mean everyone will be successful, but it does mean everyone will have the opportunity to be successful. Honestly, I think that is the most exciting thing about the time in which we live. At ASI, we are simply providing the opportunity, whether you want to publish for free with Booktango or use an assisted self-publishing imprint like AuthorHouse or iUniverse or publish with an imprint tied to a traditional publisher like Westbow Press and Thomas Nelson or Balboa Press and Hay House. Not that long ago, authors only had one choice: find an agent and pray they could sell the manuscript. That has all changed, and I think that is amazingly exciting. Too many authors publish a book with the expectation that the world is just sitting, waiting for their manuscript to get finished, and once they make it available for sale, the world will come to them. The reality is, being an author takes an informed, consistent effort, but when you get those e-mails from readers that tell you how much they enjoyed your book or found it helpful, it is one of the most rewarding experiences you can have. Certainly, there are economic considerations when it comes to publishing, but I think the one common goal that unites all authors is they want to impact people with their writing. That’s why those motivations I mentioned on our call are so key. Writing to help others or telling a story that has to be told or supporting a business or ministry are worthy pursuits because they impact people. As I say to authors all the time, I don’t know how many books you will sell if you publish, but I know how many you will sell if you don’t. I don’t know how many people you will impact with your book if you publish, but I know how many you will impact if you don’t. And to all the naysayers and fearmongers, I would like say: quit bickering about methods, and let’s encourage authors to seize the opportunity. The 4 different publishing paths authors can pursue today. It was that long ago that becoming an author meant there was one path to pursue. Find an agent to represent you and then have that agent sell your manuscript to a publisher. But as you know, the indie revolution has created more opportunities and choice for authors than ever before and so now there are four different paths authors can pursue to get their work into the hands of readers. The first is what I call the Free DIY path. This is the author who uses a publishing tool like Booktango, Smashwords or Lulu to create a formatted book for limited distribution. It may only be an e-book and only for sale on the publisher’s web site, but it is out there and available for readers. The second publishing path is what I call the General Contractor path. These are the individuals who serve as the “general contractor” for their book project and obtain all the services they need to create, publish, print and distribute their book. Some of the work they do themselves and some they hire out , but they are in control of the whole project. I find this group is currently the most vocal and the ones most proud of how they are sourcing everything themselves or doing it on their own. Which path is best for you? It depends on the skills, time and dollar investment you can make and what is your ultimate publishing goal. More options mean more opportunity for authors. Publishing Package path may mean paying more to get published than with the first two paths, but there is a convenience and time savings to working with one company to get everything done. For whatever reason, the General Contractor authors seem to be most critical of this group of authors because they feel like they are overpaying to get their book published, but I think they are missing the point. You absolutely can use other means than a publishing package to get published, but if you don’t have the skill or time to mess with all the details, working with a professional services company is the fastest and easiest way to get to the goal of a published book. The fourth path is the one that has always existed and will continue to persist. It is Traditional Publisher path. However, the indie revolution has changed where traditional publishers are finding authors they want to pick up. It used to be they would only find them from query letters from agents, but now they are actually finding authors who are using free DIY, general contracting and publishing packages to publish. That means the walls that have historically stood between authors and a traditional publisher have been torn down. Now each of these paths has advantages and drawbacks, but the most important thing is that each of them can get you to the place where your book is available for readers. Which path is best for you? It depends on the skills, time and dollar investment you can make and what is your ultimate publishing goal. But you have four paths to choose from instead of just one. That is why it truly is the best time in history to be an author.